FireLine is a superior fishing line made of strong fibers braided together and fused, but some may not know that it can also be used as a superior beading thread, though it is somewhat more expensive than other beading threads. If you can't find FireLine in your local craft store, it can be found at most sporting goods and department stores. Beaders especially like FireLine because it is strong, resistant to abrasion, requires no conditioning, and does not stretch out, making it a particularly good beading thread for beginners. Although FireLine is available in a limited number of colors, the crystal white is lightly transparent in color and can lighten up the color of most seed beads, particularly transparent ones. The most versatile color is arguably smoke gray, going well with neutral, dark, and bright colored beads. Like any dark thread, it will alter the color of transparent beads to darker tones. If you are feeling adventurous, FireLine is also available in blaze orange and flame green. FireLine beading thread is best used for off-loom bead stitching and stringing small gemstones, seed beads, and freshwater pearls. FireLine works well for beadwork which is subjected to high levels of wear, such as peyote rings and bracelets. It can be a bit stiff for some bead weaving, such as beaded ropes, where a supple drape is preferable. For the same reason, FireLine is not recommended to make beaded fringe or tassels. It is also on the stiff side for bead embroidery, where many stitches may be required in a small area. 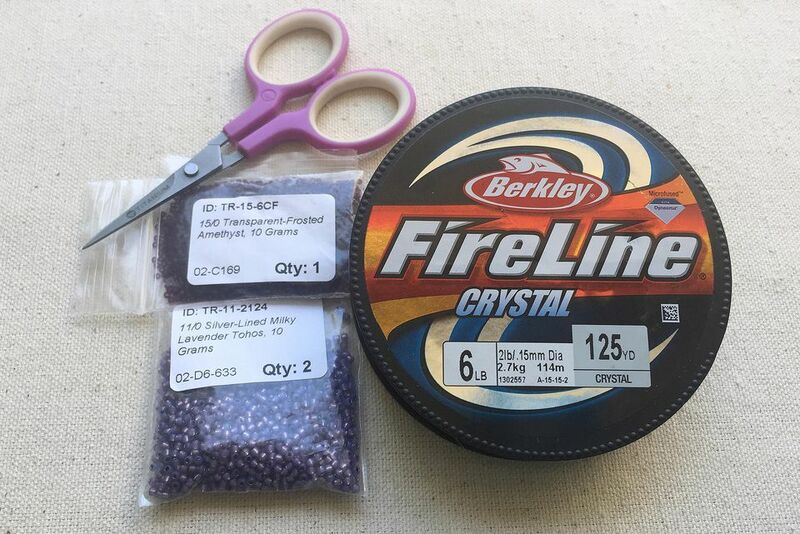 Stiffer than many other beading threads, the heavier weights of FireLine are suitable for use with metal seed beads, bugle beads, and crystals -- all beads where the sharp edges of the beads may cut other threads. FireLine is sized according to pounds similar to fishing line. The number of pounds is the amount of pressure to break the line—useful information for fishing. The higher the pounds, the stronger the thread. For most beading, six-pound FireLine is a good starting point. Six-pound FireLine will fit in needle sizes from 10 to 13 and can fit through beads up to a size 15/0. However, a smaller size FireLine may be necessary if multiple passes through the beads are required. FireLine is available in sizes from two pounds up to 20 pounds test weight. FireLine is widely available at local bead shops and online. FireLine can also be purchased in large spools at sporting goods stores and in the fishing and tackle departments of department and discount stores. When it is sold as a beading thread, FireLine is found in packaging with the BeadSmith brand. FireLine is manufactured for the fishing industry by Berkley. FireLine is sold by the spool in 50-yard, 125-yard, 300-yard, and 1500-yard lengths. Packaging for fishing is the same as found for beadwork. FireLine is not biodegradable and will not deteriorate over time.